It may be the Christmas season, but the Outfoxed gals do not take a vacation from slander. With J$P Video! 'Tis the season of good will toward men, but regardless of the time of year, Fox haters do not relent, neither do they sleep. We spotted a few troublesome fictions, and it will surprise no one that most of them were concocted by the newshounds (another fine product of the Outfoxed mob). Apparently Doocy thinks it may be a plant since the woman campaigns for Hillary. The way he phrased it (like he believed she was a plant) and then asked for emails on who believes this -- well, guess what? A little later in the show he said he had not received one email that said they believed Hilary, they believed the woman was a plant... This is total conjecture. Doocy goes over the story time and time again and makes his belief of her being a plant, of course people are going to email saying it's a plant. Hugh Hewitt was so eager to smear Democrats that he mischaracterized Senator Joe Lieberman as the “standard bearer” for Democrats... I wonder who Hewitt thinks is the other standard bearer, Zell Miller? Fact check: Hewitt did not say Lieberman is a Democratic standard bearer, but rather that he used to be one. And, if Ellen thinks really, really hard, she might remember that Sen Lieberman was the Democratic candidate for Vice-President of the USA. Or, as they say in politics, one of the party's two standard bearers. We pointed this out in a comment, but it was deleted (hereafter WPTOiaCBIWD). $6 million in one day, a record for any candidate. For this he was deemed worthy of a few minutes air time on FOX News where he raised some eyebrows. Unlike media-annointed "viable" candidates, however, Comgressman [sic] Paul only got two minutes and was pointedly asked for one-word answers on important topics. 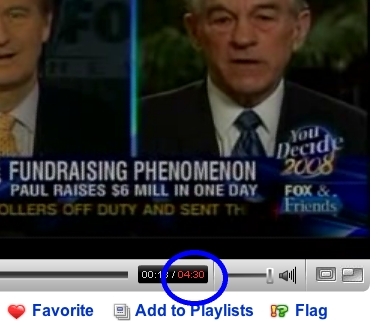 Ron Paul only got "two minutes"? An interesting statistic, if true. But it's not! In fact, it's not even close. Why tell a fib that's so easily disproven? Fox News viewers don't care about the truth, they just need someone to justify the way they feel about a certain subject. Naturally, Brit would not retract his story. Hume is so used to telling lies on the Fox Fair and Balanced Network, that he no longer recognizes the truth. Never let the facts interfere with the commentary. Fox's viewers will never know that it was a hoax, because they never watch anything else. Repeat a lie often enough and it becomes FACT to the manipulated. Update: In comments, reader johnnydollar points out something we hadn't noticed in reading the transcript originally posted to Fox's Web site or in watching the rebroadcast, which is that Hume corrected the story on-air shortly after initially reporting it. Our apologies. We give props to Mr Koppelman for honesty. Note to the newspoodles: Salon didn't scramble to delete a comment that pointed out an error. They didn't deliberately hide the facts from their readers by allowing a false report to stand uncorrected. Perhaps you dogs can learn a new trick from Salon: telling the truth. Concerning the last line, Johnny. First, they would have to take time to look up the definition of "TRUTH" and second, they would have to have the brain cells to comprehend what they just read. As one can tell by their tail chasing poster's, the brain cells are few and far between. Rabies does destroy the brain thus the reason for calling themselves "HOUNDS." An aside, that auction is raking in millions from their legions of rabid American Hating minons, LMAO. Well done as always $. I just wish that one of the mutts would have the courage to defend themselves. And while I'm wishing for things... I'd like a big screen television, please. ImNotBlue, I suggest sh***** in one hand and wishing in another and see which one fills up first. Note: you may end up with something that smells like a newshound. I might bring a defamation suit against NH.. I've been defamed and slandered/libeled on their board. Good work documenting the distortions, lies, and selective censoring on the FOX hater blogs.